Got a movie format that your iMovie software doesn't support? Rest easy, there are many tools which can convert your media file into an iMovie friendly version. Know which tools are these and how you can get started using them. Do you enjoy using iMovie to edit your videos and constantly take advantage of its powerful yet user-friendly approach? While it makes it easy to edit videos and create content, iMovie does have a limited range of formats that it supports and so you may encounter difficulty when you try to load certain videos into it. Generally speaking, iMovie supports most MP4 formats, along with MPEG-4, MPEG-2, AVCHD, MOV, DV or HDV. If your video's format isn't supported by iMovie you will have to convert it to a different format beforehand, otherwise, you won't be able to edit it using iMovie. While that may sound like a lot of extra work, it is actually fairly easy using Movavi Video Converter for Mac. In fact, it will take you just a couple of minutes to learn how to import videos to iMovie by converting them into the format that you need. Needless to say, you will need to first download Movavi Video Converter for Mac and install it before going any further. The installation is straightforward, and the wizard will guide you through each step and you can launch it to get started when you're done. In Movavi Video Converter for Mac's interface, you should then find the 'Add Media' button in the upper-left corner and click on it, then select 'Add Video' (or 'Add DVD' if you want to add a DVD video file). As you'd expect you'll then be able to browse to the folder where the video is located and select the video that you want to convert for iMovie. Another way to add videos to the converter is to drag and drop them into the working area, which may be more convenient if the folder with the video is already open. Next, open up the 'Popular' tab in the bottom section of Movavi Video Converter for Mac's interface to see some of the popular presets that are available. In this case, you will want to select the 'MP4 for iMovie' preset that will automatically use the best video format and settings for iMovie. Seeing as you'd like to import the video to iMovie when you're done, it would be a good idea to upload it to your iTunes media library. That can be done automatically within Movavi Video Converter for Mac itself, and you just need to click the 'Share' button in the top-right corner and select the 'iTunes' option. If you want you can click on the 'folder' icon beside to 'Save to' field and set up the destination folder where the converted video will be saved once it is done. Assuming there are no other areas that you want to set up, you can click on the 'Convert' button to start converting your video using Movavi Video Converter for Mac to make it ready to be edited with iMovie – and when it is done the folder containing it will open automatically. Make no mistake the steps described above can be used to convert your videos to other formats as well, it is just convenient to use the preset that is tailored specifically for iMovie in this case. Additionally, if you explore the rest of the presets that are available you'll see that Movavi Video Converter for Mac has hundreds of different options that are tailored to various devices and platforms. Aside from letting you convert your videos so that they're the right format for iMovie or other devices and platforms, Movavi Video Converter for Mac has numerous other features that you should explore. As a starting point, you could use it to resize video frames using different methods or to compress video file sizes and make them smaller. Arguably the most notable feature is the fact that it can convert other types of media files as well – i.e. audio files and images. Because of that, Movavi Video Converter for Mac is able to cross-convert media files for certain tasks. It can create animated GIFs by converting video clips, extract audio tracks from videos, or grab screenshots from videos as well. Furthermore, Movavi Video Converter for Mac has several editing tools that you can take advantage of. 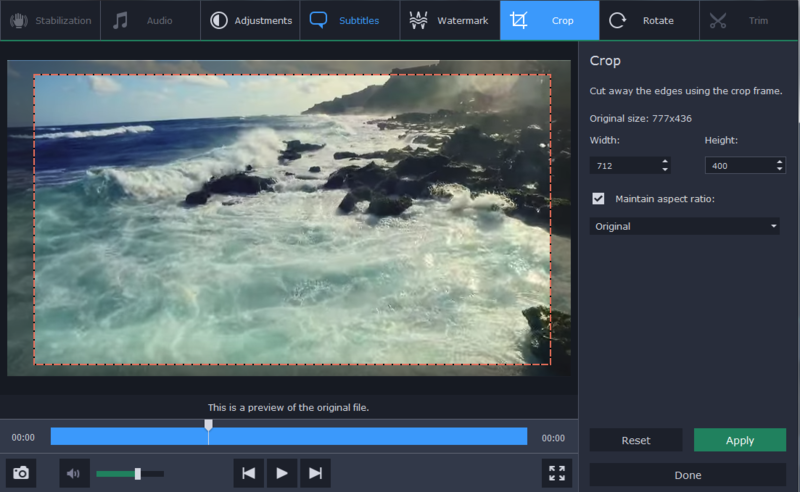 While certainly nothing on the scale of iMovie, its tools will give you the means to improve the quality of your videos, fix shaky footage, add captions, cut and join video segments, and more. To sum it up there are numerous ways in which Movavi Video Converter for Mac could help you when you're handling videos or other types of media files. While its main role is as a video converter, its additional features should not be discounted as they will likely prove to be useful at some point or other.